Newly we offer Rolfing in city Cheb - Eger. Near Bavarian German border, close to city Waldsasen, Marktredvitz and Hof. Please arrange your terms of Rolfing session using contacts of Prague Studio Aither above. We work with appointments and an arranged dates! In case of an urgency or if you have to commute you can avail of a weekend alternative service. If we can´t manage to answer the phone, please leave us a message. We will contact you as soon as possible. In case of an urgent appointment or an appointment cancelation, please phone or text us. Thank you. 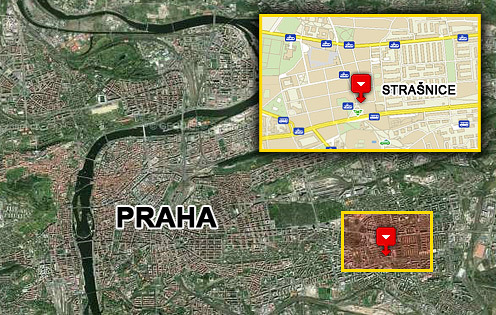 Studio Aithér Prague – How can you find us? Bus connection MHD: Tube train track A, tramway number 7, 19, 26 or bus number 175, 188, 224 to the station Strašnická. Our Studio Aithér is located right on the street Strašnická, by following the street Starostrašnická in the direction of vozovna Strašnice (you can use tramway here), on the first corner make a right turn to the steet named Mrštíkova (it´s the first street opposite the tube train). Walk through passage house nb. 37, and on your right side at the yard you can see our AitHér studio 37. Easy, convenient transportation by car trouble free parking (look up the map). We recommend to park in unguarded free parking zone P, next to Bila store. By learning new things we grow and develop constantly. If you visit our web pages regularly, you can learn about news and upgrades All new services we offer can be viewed at our current listing which we have prepaired for you.